It is necessary to provide effective sanitising of the car seats, headrests, carpets, mats, ceiling and upholstery. This is work which requires having suitable products for sanitising and skills to achieve best results. Regularly and properly cleaned upholstery is rid of the allergens, stains, dust and soiling that it tends to gather. We can restore the real colours and the flawless state of your upholstered fabrics applying effective and comprehensive sanitising of all areas. 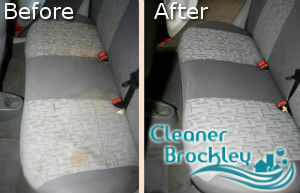 Our car upholstery cleaning services are implemented in the SE4 Brockley area by experienced and qualified staff. Call us to specify your requirements and get the professional and effective car upholstery cleaning which we perform in Brockley and nearby. We guarantee you excellent results every time and work done in line with your demands. The cleaners in our company check the fabric and condition of each car upholstery to select the most effective detergents and machines for it. They hoover the visible dirt with vacuum cleaner and stiff brush attachments. The cleaning is continued with spraying certain areas and applying hot water extraction. 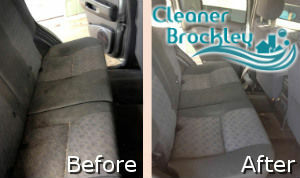 It makes the car seats and mats cleansed in depth, looking like new and smelling fresh. Our staff remove the moisture from the upholstery with the help of industrial dryers. In the end, they spray the interior with deodorisers and the car can be used right away. In case you have leather car seats and upholstery we apply dry cleaning on such. Our cleaning technicians have the necessary skills and equipment to provide excellent car upholstery cleaning which we offer in SE4 to owners of vehicles of all makes and models. Use our call centre or booking form to schedule the sanitising of your car interior.